Sorry that it's been so long since I've posted but it's been an interesting season and this is one post I was not overly eager to write. As I noted in my last post for 2017, I was struggling mentally and physically. My left foot was still more sore than it should be after Boulder Ironman but it always felt better after a few days of rest. I needed to do another marathon to qualify for Boston 2019 since I was not able to run it in 2017 so I looked for a fall marathon. Running was still my happy place and I signed up for the Twin Cities marathon in October. It's one of my favorites and I love to go back to see old friends. I had some niggles in my foot and opposite hip (compensation anyone?) but felt great on race day. I thought I had a PR but missed by 49 seconds because I couldn't remember how far ahead I started my watch (duh!). Overall, I was very happy and qualified with enough time to sign up with those beating the qualifying time by 10 minutes so I should have no problem getting in. My foot was swollen and painful after the race so I took four weeks off running. It helped but it was still not completely pain free once I started again. I saw a new practitioner that was convinced it was tightness and inflammation so he worked on it but it was about the same... okay after a resting but sometimes a little tender after running. I didn't have anything major on the plans for 2018 but Boulder 70.3 and some shorter races. I did want to try my first longer trail race with the Greenland 25K in early May. The practitioner I was seeing thought it was fine to do it. I did it and had a really great day. I loved running on the trails, bombing the downhills and got second place in my age group. After the race, things did not look good for the left foot. My second toe was now drifting towards my big toe and I have a "V" between the second and third toe. I couldn't put weight on it and I was concerned. The practitioner said I should get an ultrasound. I was skeptical on what the ultrasound would show but he sold me on it. It didn't show much and so the radiologist suggested an X-ray. I was just hoping that paying for these would not lead me to an MRI on top of it. The X-ray showed some bone changes so I went back to my podiatrist and he was concerned. Hence, another MRI! The MRI showed arthritis and several mild issues causing swelling. I got another opinion and started with EPAT Shockwave Therapy. It helped somewhat and I didn't run for a month but I had a sprint triathlon and a mountain bike race coming up. The doc said it was okay to do them. The sprint went well overall. My swim was the usual (slow! ), my bike was strong and my run was a little slower than last year. I finished with almost the same overall time as last year and took first in my AG. I was happy and it felt so good to be out there competing! I next day I had my first ever mountain bike race. Keep in mind that I am not a technical rider by any means but it was in Bear Creek, which is where I do most of my rides, they had a "Never Ever" category, it was all women and I had coerced some of #chicletmtb friends to do it with me so why not?! My plan was to try to restrain my desire to compete enough to not crash and injure myself. On the start line I was nervous but really excited. As we started, another woman took off from the line. I couldn't help myself and I thought "game on!" She was ahead of me but I could see that I was stronger at ascending so I knew I could get her on the climb at the beginning of the second loop. I still wanted to get her sooner and I was surprised at how easily I was able to pass people on the trail. But, I got a little too eager and went down on a descent. A few scrapes but nothing major so I got back on my bike as quickly as I could to try and make back time that I lost. Sure enough, I was still behind at the start of the second loop. Her coach was telling her to keep me back but I couldn't let that go, could I? I passed her on the climb and went hard to put as much distance as possible. I saw that she was pretty far behind so I felt good but things slowed down as I was stuck behind others on the next steep climb. I tried to pass and almost went down so just decided to cool it and go hard when I can. I ended in first, with a time faster than I expected so was really excited! I'll likely do it again but I REALLY need to work on my technical skills! After the races I knew it was time to focus on health... rest my foot and reduce my stress levels. Luckily, we were headed to Denmark for two weeks and the time change helps with sleep and unplugging. You can't work and get stuck on social media when everyone in your circle is still sleeping. The trip was amazing and I even got some overnight dates with my hubby! I came home with my foot feeling a bit better (still not great) and my stress markers much improved. As my foot healed slowly, but not as quickly as the doc expected, he requested a second read on the MRI. Sure enough they found a small tear/sprain on the plantar plate. I did more research and understood how difficult this injury is to heal and that it just takes rest and time. I added some ligament and tendon support with nutrition and supplements and committed to not run for as long as it takes. Through this something wonderful happened and I fell in love with my bike. I wasn't riding as long as I would during Ironman training but I was riding often. If felt amazing to go fast and my power numbers were climbing. But, I was still missing the endorphin boost I get from racing. I looked into options and the time trial season had passed but I found some aquabike options. There was a long course aquabike the next weekend. Even with all my biking, I felt undertrained for the bike and I knew I was undertrained for the swim. I debated in my mind for a few days and decided to just go for it the day prior to the race. To be honest, I was more nervous than excited as I went to sleep. Why, I don't know as I had done the distance may times and I didn't even have to run! Everything went so smoothly on race day, it was almost eery. I got the most perfect transition spot and the sunrise was unbelievably gorgeous. To top it off, we had some cloud cover come in just as we were swimming towards the first buoy. If you've ever raced in Boulder, you know how difficult it is to see the first buoys when the sun is rising. The swim was long and I felt it due to my lack of long swims in training but my time was not horrible. I got onto the bike and started to pick people off (that's the benefit of being a really slow swimmer!). My plan was to pace myself on the first 25 mile lap and then go harder on the second. It felt so good and the wind was calm. I was probably not great at restraint on the first lap but it's hard to know how much harder I can go when I don't have to run a half marathon off the bike. My pace was good but the last 20 minutes hurt! I just kept telling myself that when I get off the bike I'm done! I finished faster than I anticipated with higher watts than I expected (I don't really follow a power plan in a race but always review after. I'm more of an RPE girl). 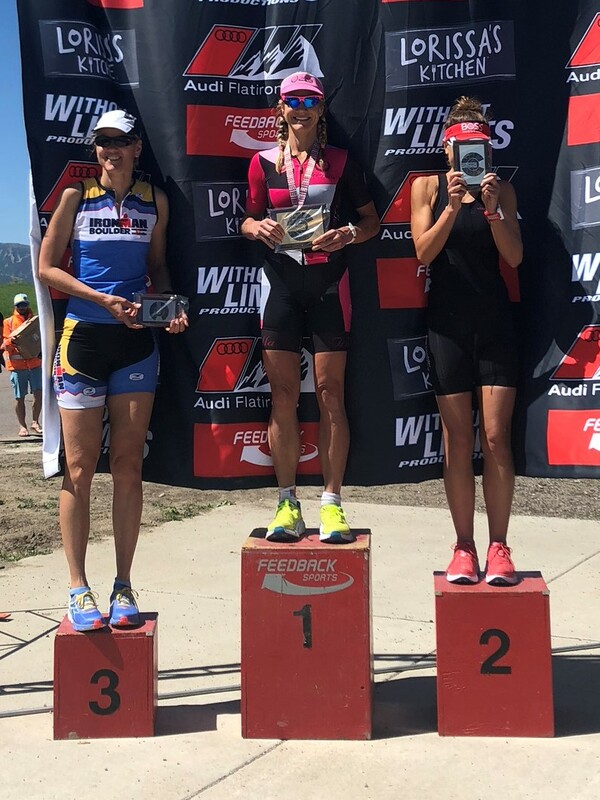 To my surprise, I was first female overall and second overall with the males included.. but, let's be honest there are not that many competitors in the aquabike. Had a follow up with my podiatrist and he thinks my foot is healing well but I still feel something. I'm trying to be very careful and not run too soon as the next step is surgery. Doc says I can start to add in a few minutes of running but I'm going to be very cautious and listen to my body. I know one little doggie that will be happy when I can add in a few minutes of running. She always benefits when I'm returning from injury. Not so much when I'm at full capacity. Sorry, Kloe! Also, from a health standpoint, things are going very well. I was not mindful of my stress levels last year and it started to take a toll. Fortunately, I'm aware and I test myself so I caught things before my body was ready to throw in the towel. All my labs are looking better and I'm feeling great. That's is the most important thing to me. As I say, health first and performance will follow! August 3, 2018 by Kirsten Miller.